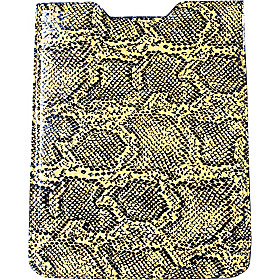 Protect your iPad in style with this hip Snake print cover from Leatherock. The Leatherock Cozy iPad Cover is made from rich leather fabric and features an allover snake print with a slip in design and side gussets that can accommodate the iPad 1 or 2. This iPad cover has a soft leather lining that keeps your iPad safe from bumps, scratches, and day to day wear and tear. Carry this sleeve under your arm for quick trips around town or slip it inside your tote bag or travel bag for an extra layer of protection when you’re on the go.